Best Value - 2/1 home is located in Islamorada, Florida in the beautiful Florida Keys at mile marker 74. The master bedroom has a king size bed and 2nd bedroom has a trundle bed, which is a single bed, with another single bed under the first one and can be used as two twins or one queen. The L-shaped living room/kitchen has a large sofa and two rocker recliners, TV with cable, Wi-Fi, full fridge w/ice maker, microwave, full gas stove/oven, gas BBQ grill, all the small appliances and utensils you need in the kitchen and central air conditioning and heat. The dock can accommodate your boat up to 25 feet. As you can see from the pictures, the other side of the canal is Mangroves which provides added natural privacy. Enjoy deep blue water or back country fishing, dive, snorkel, and swim on a Bahamas perfect, clear, white, sandy beach. Take long relaxing strolls and view beautiful waterfront homes or sip a cold one, gazing at glorious sunsets. As a reference, the south end of Miami is mile marker 126 and Key West is Zero. There is no road noise as the home is 1/2 mile from the main road (US#1) and there is virtually no traffic on our dead end street. There is parking in front for two cars. The back yard is grass and behind the yard is the dock on a wide canal just 200 yards from the bay, then 300 yards to the most beautiful, Bahamas-type private beach and just 5 minutes to the ocean. The bridge to the ocean has a 65 ft tall clearance. There is a gas station/convenience store within ½ mile. The house is close to supermarkets, bait and tackle shops, restaurants, attractions and the Fishing Fleets at Whale Harbor, Bud & Mary’s and Caloosa Cove Marina. A short ten minute drive is “The Theater of The Sea” attraction where you swim with Dolphins and Sea Lions and view the local marine life and just twenty minutes further to John Pennekamp State Park. Manatees, tarpon, mangrove snappers, and other native fish species swim behind our dock. Beautiful tropical vegetation, Pelicans, White Cranes, other birds, and marine life are all around. There are great restaurants all over, lots of attractions, great fishing, snorkeling, diving, golf courses and plenty of shopping. It is a short 2 hour drive from the Fort Lauderdale airport, about 1 ½ hours from the Miami airport and just 75 miles to Key West. The home is very comfortable, clean and cozy and accommodates four (4) people. This is a rental of the ground level portion of the home, so there are no steps. No smoking & no pets please. Any questions call Ron 954-325-8113. The lure is the water - we absolutely love fishing, lobstering or just relaxing at the private beach. We live two hours from this home so it makes a great place for us to get away and recharge. We under-promise and over deliver - we know you will really enjoy this home. This home is not just rental property owned by an investor. This is my second home. It is were I bring my family and friends to share unforgettable times and everlasting memories. When you enter you immediately get a comfortable, laid back, at-home feel. 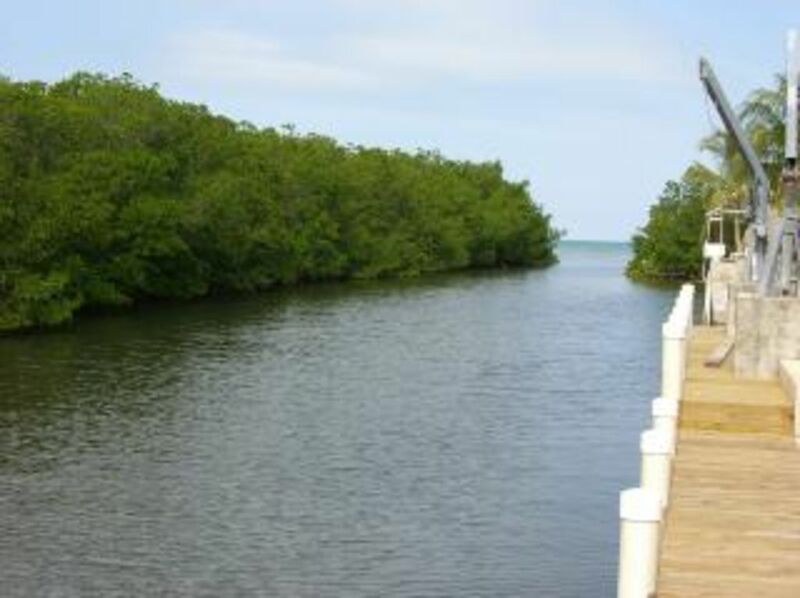 On a canal 4 lots to the bay with the mangroves behind you provides unequaled privacy. The ground level entrance makes it very easy for those that have difficulty with steps but it is also safer for children. The private beach is one of few in all of the Keys. ISLAND LIVING AT ITS BEST!!!! THIS HOUSE EXCEEDED OUR EXPECTIONS. IT IS A COZY HOUSE IN ONE OF THE BEST LOCATIONS IN THE FLORIDA KEYS. THE ACCESS TO THE FLORIDA BAY AND THE OCEAN WERE FANTASTIC. DEEP WATER FOR THE BOAT, FISHING BEHIND THE HOUSE, PEACEFUL AND QUIET FOR THE EVENING SUNSETS. I WOULD RECOMMEND AND OUR FAMILY PLANS ON RENTING AGAIN NEXT YEAR. THE HOUSE GIVES AN ISLAND FEEL - MUCH BETTER THAN A MOTEL/HOTEL. THANKS RON!!! Although we do not have many written reviews, our repeat/return guests tell the story the way this guest felt - under promise and over deliver. This is not just a rental property. It is our second HOME were we bring our family and friends to spend quality time, in a great location with very comfortable accommodations. To our guest - glad we exceed your expectations and see you next year. We had a great time staying in this vacation rental. It was very relaxing and close enough to any place we wanted to go. The neighbors are great people. We had a very relaxing and enjoyable vacation. The owner of the home made the rental process go very smoothly. We would definitely come back!! It's always nice to read a testimonial that what the owner stated about their property was true and the fact that our guests would return for a future vacation makes it just that much better. 5 out of 5 - thanks - we really try. Property was just as described. Clean and cozy. The owner of the home made the rental process smooth and simple. Had a really enjoyable stay, and definitely will be back! with a Long Wading Area. These are located on or nearby the property. Weekly Rate: contact for availability and rates Monthly Rate: $3000 - $3500 $3200/month - General Rate - email me - tell me when, I'll let you know the rate - ASAP. Months with special holidays may be higher...discounts available for multi-month rental.